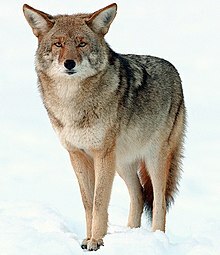 Coyotes (Canis latrans) are quadrupedal carnivorous mammals related to wolves and jackals. Let's appreciate coyotes for the amazing beings they are. They offer valuable lessons in survival. Though coyotes try our patience they're a model animal for learning about adaptability and success by nonhuman individuals striving to make it in a human dominated world. Coyotes, like Proteus the Greek, who could change his form at will and avoid capture, are truly "protean predators." They're a success story, hapless victims of their own success.